Takahashi Minami’s final theater performance took place on April 8th, 2016. Here is an English translation of her final commentary. There were three main talking portions towards the end, which I’ve split up and translated accordingly. This portions takes place right after “Senaka Kotoba” is performed. Ahhh… it’s over. It’s over! Right this moment, after Oshima Yuko graduated, I remember the words she said then. The saddest thing is not that I’m graduating from AKB48, but that I’m graduating form this theater stage. I finally understand the meaning of those words now. I wasn’t here everyday for 10 years, but I was raised here, on this stage, performing each day. I’m really thankful. This is a special performance, my last performance, and you’ve allowed me to sing the songs I wanted to sing. It might have been selfish, but it was so fun. It was really fun. Today, I’ve done every I’ve come to do. It’s all over with. When I look back, these 10 years weren’t always fun times. There were painful memories too. I cried so much. Maybe I cried more often than not. But, because of those painful times, it became my time to look forward. Why did I become part of AKB, and come this far? Some people might thing it is hypocritical for me to say, but it is, really, honestly, because the fans were here for us. If you weren’t here for us, we wouldn’t have been able to do our best. I’ve always said that I never thought about quitting. But, honestly, but there were moments, in times I almost can’t tell you about, that my heart was almost broken. But there was always someone to ask me if I was okay; and it is those words that have made me stand here today. Really, I have nothing else to say. I’ve said so many things. People think I’m really talkative. At this final point, I’m not “Takamina”, but I’ve become “Takahashi Minami” again, and I think it’s probably because I’m in this theater now. I’m absolutely absolute thankful for these 10 years. I’m so happy. I want to say thanks to all the fans who have supported me until this day. I also want to thank the staff who have supported the 48-groups. (Facing the other members) When I was the General Manager, thanks for always following me. So much… much… I was constantly talking, becoming angry, and I felt really sorry. But, everyone always listened to me. It’s because everyone lent me their ears, that I was I able to come this far. And I honestly feel really guilty for handing Yokoyama the title of General Manager, at this very moment in time. But, I honestly felt that time doesn’t stop. It’s keeps continuing. Since I was 14 years old, to becoming 25 today, I always thought that I wanted to be in AKB. But the times comes when one needs to graduate. 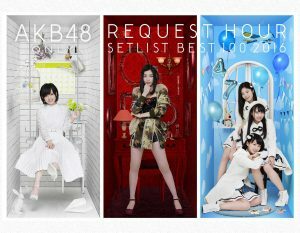 It might be a lonely thought, but I’m going to be entrusting AKB these members I’ve met along the way — they are my most precious treasure from these last 10 years. I’m entrusting the future to these members, and I’ll be moving forward. 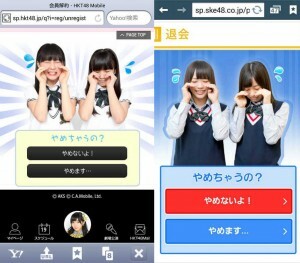 Senaka Kotoba. From now on, I’ll be showing my back to my remaining junior members. Please listen to this next song! Takamina: Thanks you very much for coming. And sorry. It was a really happy 10 years. 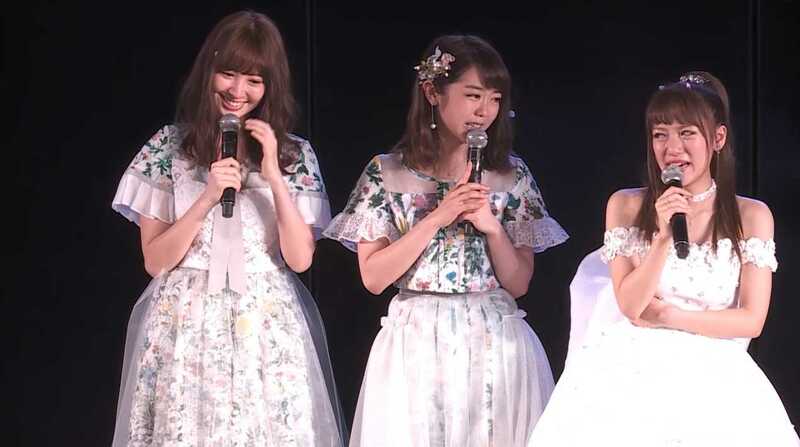 Takamina: “Everyone, all of you, are my graduated senior members. I’ll be chasing after you, and I want to go forward and never look back. These 10 years, I’ve definitely been constantyl running. But, even now, I do not intend to stop — I want to keep running. I hope you’ll all follow me. If I’m with you, I feel as if I can go anywhere. Thank you to all of you who have supported me. Lastly, to AKB48, thank for truly, for these 10 years. At this very, very last segment, Kojima Haruna, Minegishi Minami and Takamina are on the stage alone, and Minami makes her final exit. Takamina: As members of the same generation, it’s really painful leaving you two behind. Minegishi: I think Kojima is the most in trouble. For me, I think I can still stay a little longer and do my best, but I think Kojima-san is in the danger zone. 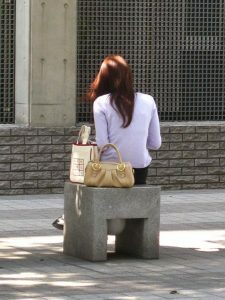 Kojiharu: What should I do? Takamina: At the handshake events, is there someone who can be there as long as you? Minegishi: Sorry, okay, I always go home before you. 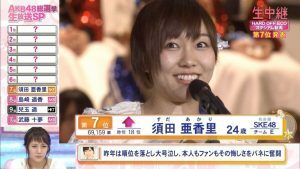 Takamina: Really, I didn’t think I would graduate first. Takahashi Minami: Here, lately, rather than what to talk about, everything feels like a hazy. I really wanted to say something. I really had a lot of things to say. I even wrote things down the things I wanted to say. But I really couldn’t say it all. As it is, this is the end! In one way, when I said that I wasn’t “Takamina”, but had become, “Takahashi Minami”, I think it’s because I was standing here when I was 14 years old. I’m sorry for going on that weird tangent. 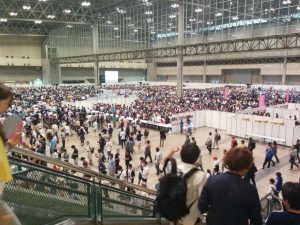 It’s really embarrassing standing in the center like this, it’s like a disease to us. But, well, I really want the theater to continue to exist. It’s because I was born and raised here. When I’ve graduated, I won’t be able to come back, and I won’t be able to stand here anymore. But I don’t want to come and watch. I want to sit of over there, like a normal person, and just watch. I want to see those pink lines of tape expand to 20 or 30. I want to see an AKB48 group whose members don’t know who I am. It’s been really fun. Really fun. I was worried when I was singing “Sakura no Hanabiratachi”, that I would stop singing and start crying, but I was barely able to sing it out. It’s all over now. Starting tomorrow, I’ll be doing my best as “Takahashi Minami”. Everyone, thank you very much. Us three together, let’s do our best. Thank you very much! Kojiharu: Hey, can I say one last thing? 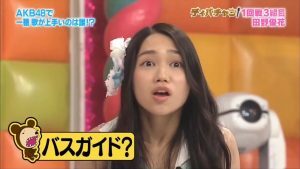 Takamina: You don’t have to ask! Kojiharu: There’s a grain of rice stuck in your hair. Takamina: A grain of rice on my head? No way, really? Takamina: A grain of rice stuck there all this time? No way. 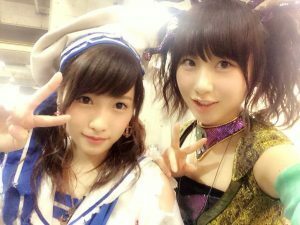 Kojiharu: It was so cute. Takamina: Why did a grain of rice stick to me at my graduation theater? No way! 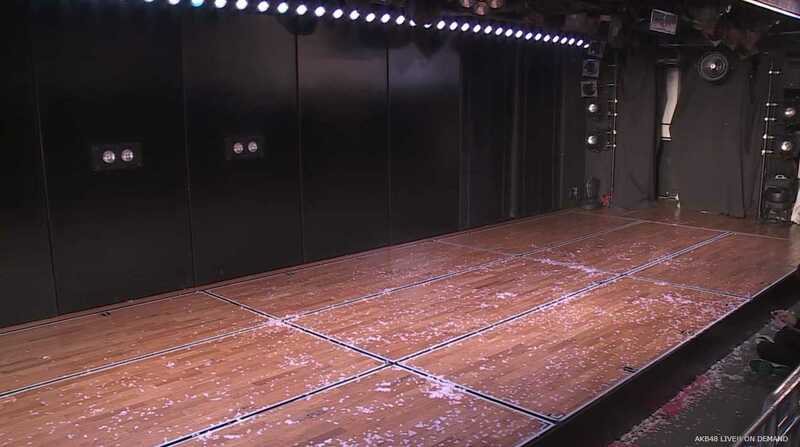 Takamina is heading off stage, leans down and touches the stage floor, one last time. Takamina: Thank you very much! there’s still some but not much..
anywhere i can watch this? So I watched this video clip just yesterday and made out some of the translation but not all of it. Reading this though… man, this really, really hits my heart in a hard way. So sad, so beautiful, so perfect, and Takamina is now Takahashi, and I love it. I really do. TO think, one day I might be sitting next to the girl with the bright big ribbon in her hair in the audience, and not even realize that girl was the soukantoku of AKB for ten glorious, defining years. I can only wish her the very, very best. And with her leaving, the second era of AKB begins. 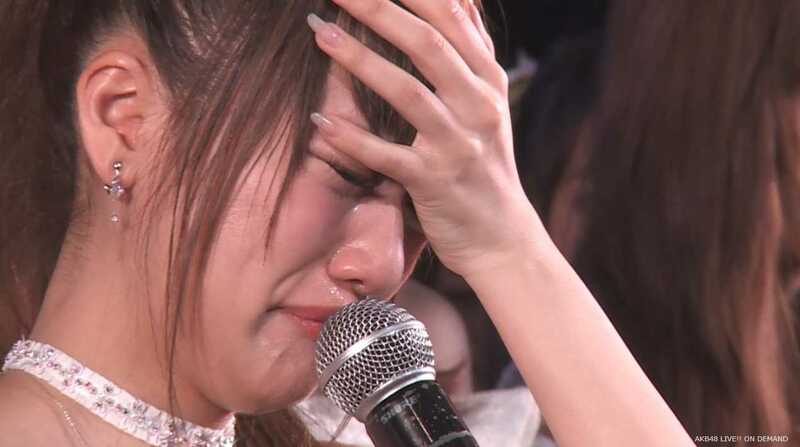 i’m not even a takamina oshi but i was almost in tears watching the final theater performance, you could really tell from her words that she loves AKB and she wouldn’t be able to say things such as “i want to stay in AKB” and the like. It only goes to show that they’re truly family on cam and off cam it all shows. Ok i dont want to generalize maybe not all but for me, most girls in AKB really find good friends and turns into a family afterwards.